Elevolution For Bread | OhGizmo! This is huge news in bread talk. The British food company Hovis has invented the world’s first invisible crust! They have “discovered a way to bake a loaf without the bits you don’t like -the crusts!” Of course the company didn’t reveal how it is made, it just said they are baked with special tins. 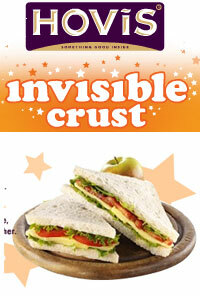 The word “invisible” makes it sound so magical, compared with “no crust”. Just so you know, 67% of English kids dislike crust and 35% of parents cut it out. This bread will cost 25% more than regular bread. Check out Hovis’ Invisible Crust. A British food company has invented “invisible crust” bread….